Guacamole and tortilla chips — the only recipe you need for your next party, potluck or game day. Or for lunch! But beware, you’ll forever be on call to bring guacamole once you introduce this recipe to your friends. Avocados are on sale at your local supermarket. You find perfectly ripe ones to take home to use immediately. There’s nothing worse than getting home and finding out that half your avocados are full of yucky brown areas. Not this time! Their green skin was tinged with brown and yielded just slightly to the touch. Don’t make the mistake of buying brown avocados that are too soft or green ones that are too hard. Try to find the sweet spot of perfect ripeness in between. If your avocados aren’t ripe enough (too hard), put them in a sealed bag with a banana or apple. The gas given off by the fruit will speed up the ripening of the avocados. But if your avocados are too soft and brown, they’re only good for compost. In my guacamole recipe below, the amounts are just a place to start – they’re not gospel. I mix each ingredient in as I go and decide whether I want to add more based on the looks of the mixture. And, because of the fickle guacamole gods, you might start with five avocados but have to throw out bits of two of them. So don’t feel obliged to follow the recipe to the letter. 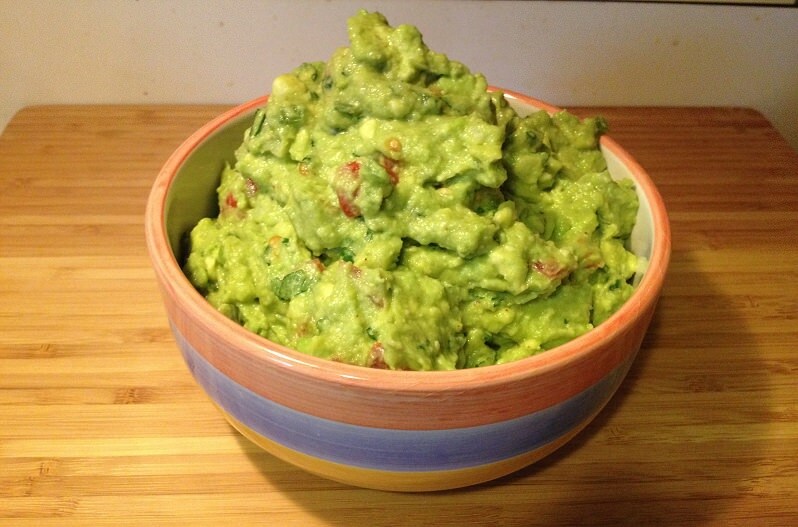 I’ve been making this guacamole recipe for years and years. I think Jim fell a little bit more in love with me when he first tried it. Such an easy way to keep a man happy. And keep me happy – the last time I made it I was just about to rustle something up for lunch. No need! Guacamole makes a great lunch. Just don’t spoil your dinner! Plus, now that we’re in football playoff season and the Super Bowl is lurking in the future, you’re bound to be invited (or host) a game day party. Make your guest or host duties easy by whipping up a bowl of guacamole accompanied by some tortilla chips. You’ll need a bowl and potato masher. Starting with the avocados, mix in one ingredient at a time, then decide if it looks like enough. When everything is in and combined, use a potato masher to smooth out the consistency a bit. I like having small chunks of avocado in there. Taste and add more seasonings – spices, salt and lime – if you wish. Don’t be shy about adding additional salt and lime – that’s what usually takes the guacamole to a higher level.